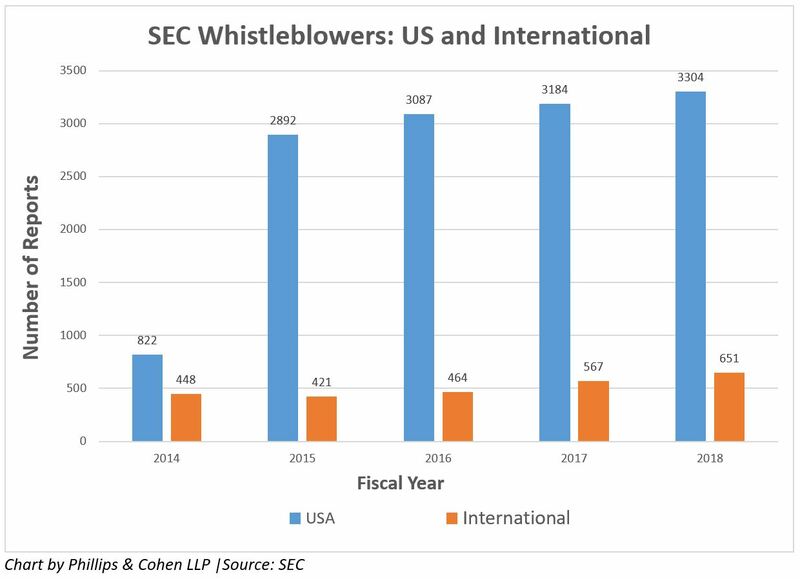 The number of whistleblower submissions to the US Securities and Exchange Commission whistleblower increased 18 percent the past year compared to the previous year, according to a recent SEC report, most likely due to a Supreme Court decision last February. The SEC also awarded more money for whistleblower rewards in fiscal year 2018 – $168 million to 13 individuals – than it had in all prior years combined. In Digital Realty v Somers, the Supreme Court rejected the SEC’s position that the Dodd-Frank’s anti-retaliation provisions cover any individual who reported securities law violations, whether through internal channels or the SEC. The court said only whistleblowers who report violations to the SEC before they are retaliated against are covered. The SEC’s “2018 Annual Report to Congress on the Dodd-Frank Whistleblower Program” said that SEC whistleblower submissions increased from 4,484 in 2017 to 5,282 in 2018 – the most submissions so far and the biggest annual jump. Before this year, the largest SEC award was $30 million (later increased to $32 million), which went to an international whistleblower represented by Kelton. Overall, the SEC has awarded $326 million to 59 individuals since the SEC whistleblower office opened in 2011. “Whistleblowers should be encouraged by the SEC’s willingness to pay sizeable awards when their information and assistance help stop major securities violations and result in large monetary sanctions,” Kelton said. She has secured SEC whistleblower awards for three clients. Roughly one out of 10 SEC whistleblowers are from outside the US, continuing a trend that has remained steady for the past few years. International whistleblowers turn to the US to report violations of the Foreign Corrupt Practices Act and US securities laws because of the financial incentives offered by the SEC and the promise of confidentiality. “SEC enforcement reaches around the world when there is a violation of US securities law, including bribery of foreign officials,” said McKessy. Since the program was created in 2010, the SEC has ordered enforcement sanctions totaling $1.7 billion based on information provided by whistleblowers, which includes $901 million in disgorgement of ill-gotten gains. Investors who have been harmed in those cases have received a total of $452 million. The SEC has proposed changes in the whistleblower program that would make the process for whistleblowers more efficient but also would set limits on whistleblower awards, which would discourage whistleblowers in high-paying jobs from coming forward, Kelton said. For more information about the SEC whistleblower program or how to file a SEC whistleblower claim, see SEC whistleblower program: an overview or contact Phillips & Cohen.